If Vincent Van Gogh were alive, he’d have approved of the CN Blue concert at the Smart Araneta Coliseum on Saturday night. More than a few thousand blue lights turned Big Dome ‘s inky interior into a starry, starry night, providing the perfect backdrop for the light-and-sound spectacle of the two-hour-plus concert. Ultraelectromagneticpop. The boys turn in an electrifying performance on stage. 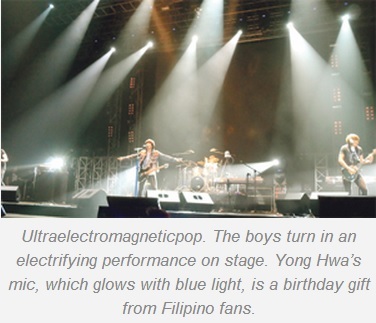 Yong Hwa’s mic, which glows with blue light, is a birthday gift from Filipino fans.